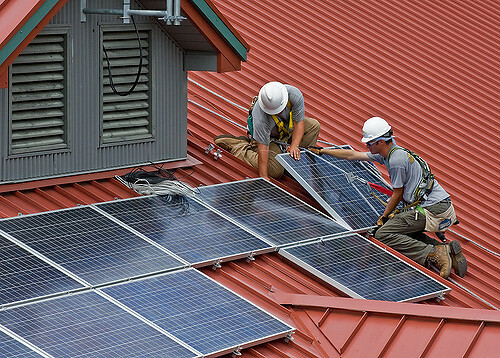 In May, the California Energy Commission unanimously approved the nation’s first commitment to putting solar on qualifying new home construction starting in 2020 – a move that’ll be good for our cost-of-living and our climate alike. Building solar on new homes is consistent with California’s zero net energy goals for new buildings, and it’s a great way of getting rooftop solar built cheaply for customers. When solar PV is installed at the time of construction, you get economies of scale and save big on non-hardware costs like customer acquisition, permitting and financing. Assuming modules are 40 cents/W and the other system components and equipment costs are 85 cents, and accounting for a 10% profit margin for the builder, a 3 kW system would cost about $4200. If you consider that cost under a 30-year mortgage at a 3.92 percent interest rate, the incremental monthly mortgage cost is about $20. Keeping in mind that solar equipment only accounts for about a quarter to a third of total solar panel system costs, these figures match with the costs estimated by the state. Under the current net metering tariff and Time-Of-Use (TOU) B rate, a TOU residential customer in the Central Valley would save $85 a month on their electricity bill from that solar array, resulting in a net savings of $65 a month – an undeniable financial benefit for future homeowners. While some have argued that the mandate will increase housing prices and do little to curb emissions, estimates from the California Energy Commision prove otherwise. Not only will the savings in energy cover increased housing costs, but it is estimated that the mandate will reduce GHG emissions by 700,000 metrics tons over three years, equal to taking 115,000 cars off the road. May’s historic measure was years in the making and involved a broad and thorough stakeholder process to ensure that California gets this right. California has a track record of setting bold precedents on clean energy, and it’s safe to say that forward-looking states are eyeing this mandate as the next benchmark of what’s possible. 1) What are the implications of this mandate for the broader American PV market? 2) How large of a role will this mandate play in achieving a 100% carbon-free California by 2045? 3) What other states would benefit most from a similar mandate? 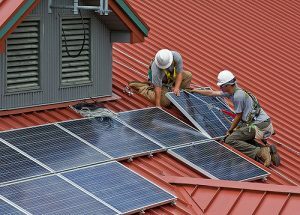 Perhaps getting out of the way of solar’s development by reducing soft costs from unnecessary and bureaucratic permitting requirements for solar would be a better way to make solar available to more households. Overly optimistic estimates of the prices of solar panels and their impact on housing affordability don’t make for good policy, even if they make for good politics. I’m not sure how you got the $4200 or that we should trust the California Energy Commission’s cost estimates, but there’s lots of academic research casting doubt on rooftop solar’s cost-effectiveness, even accounting for environmental benefits. What do you think of the academic work in this area? As technologies scale-up, costs come down and that is what we have seen for wind, solar photovoltaics, and battery storage. We have very many studies out there, such as from the US DOE national laboratories that variable wind and solar save southwest utilities and consumers $7 billion in fuel costs while increasing peaker plant costs by $200 million – extremely net positive. A new technical report carried out by Energy and Environmental Economics, Inc. (E3) and sponsored by leading CdTe thin-film manufacturer First Solar, entitled “Investigating the Economic Value of Flexible Solar Power Plant Operation” attempts to dispel the assumption that high levels of solar and wind electricity on electricity grids cause grid instability. The modeling takes utility-scale solar deployment levels up to 28% annual solar energy penetration of a grid system. The study finds that operating solar ‘flexibly’ provides additional value compared to other operating modes. The increased value of using solar in a flexible mode stems from expected reduced fuel and maintenance costs for conventional generators, reduced curtailment of solar output, and reduced air emissions. (https://www.pv-tech.org/news/new-technical-analysis-sponsored-by-first-solar-challenges-duck-curve-grid). A recent article by Business Insider (5/8/2018) puts it more strakly (https://www.businessinsider.com/solar-power-cost-decrease-2018-5) “A recent report from Lazard shows how the costs of producing electricity from various sources are changing. Energy from utility-scale solar plants — plants that produce electricity that feeds into the grid — has seen the biggest price drop: an 86% decrease since 2009. The cost of producing one megawatt-hour of electricity — a standard way to measure electricity production — is now around $50 for solar power, according to Lazard’s math. The cost of producing one megawatt-hour of electricity from coal, by comparison, is $102 — more than double the cost of solar.” California as usual is ahead of the trend, but States like MA, NJ, NY, TX etc are following fast.